The Homeopathic Coach website has been designed for the lay person or patient who wants to start finding out about Homeopathy. It provides a free video crash course covering the basic explanations about what Homeopathy is, how it works, why it is different to conventional medicine and it covers various self treatments such as how to treat sports injuries, and jetlag. Once you have read everything on my site and feel you want to look deeper into Homeopathy then check out some (or all) of the great websites outlines below. This is not an extensive list and if you have any that you would like to recommend feel free to link to them in the comments below this article on my blog. This first website is a wonderful source of all things Homeopathic from news, products and interviews with influential figures in the Homeopathic world community. It has been sending out a newsletter worldwide since 2004 and has half a million viewers each month with 40,000 subscribers reading its news. It has an excellent database of articles. 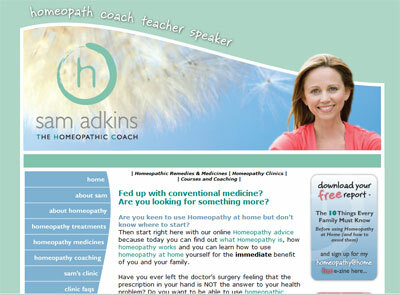 On the homepage you will find an option to click that you are either a Homeopath, student, patient or skeptic. make sure you select the appropriate route, as the portal is so vast that otherwise you maybe in danger of getting lost and it helps guide you to the information you need. Started by Homeopath and social media savvy Debby Bruck, this site is a social media interactive forum. The vast majority of members are actually practicing Homeopaths but the site is open and welcome to all. There is a wealth of information on on this site and events and seminars held. The idea behind this site is to create a space for Homeopaths and people interested in Homeopathy to connect and communicate with each other. I have made many wonderful connections via this site. This is an excellent blog of you want some rational thinking and rigorous information regarding the criticisms of Homeopathy. The blogger is an experienced Homeopath of some 20 years who retrained in Homeopathy after being a scientist. His blog gathers some excellent articles from high profile Homeopaths and less high profile Homeopaths around the world. Definitely worth getting on the RSS feed of this one! This blog is again a fantastic source of up to date articles about Homeopathy. It is not overcrowded with information and so you can find what you are looking for easily. There is also a great teacher series explaining who some of the key players in the Homeopathy teaching community are. This is a website run by Homeopathic Author Dana Ullman. Dana has some excellent books and articles on his site and you can subscribe to a newsletter to keep up to date. For more information on health and Homeopathy visit The Homeopathic Coach website ,and to have an online skype Homeopathy consultation face to face with Sam herself go here.